We all live very busy lives that we sometimes forget that it's okay to get a little R&R once in a while. Travel is one of the best ways to recharge. It's also very enriching as you get to experience new cultures, meet new people, and gain new understanding about the world. It's also something that many don't do much enough of. Which is why these DIY map coasters from The Domestic Heart will serve as a constant reminder that you need to buy that ticket, pack your suitcase, and let your wanderlust roam. Ready to make homemade coasters? You can use your dream destinations for personalized coasters. STEP 1: Gather all your supplies. Most of what you need for this project is available at your local home improvement store and craft store. I printed a picture of a map I found online, but you can use old maps if you have one lying around the house. Trace the tile on the image that you're going to use for your map coasters. STEP 2: Place the tiles on top of the map and trace around each one. Cut along the lines. Cut the image for your homemade coasters. STEP 3: You want your map to be slightly smaller than your tile, so that there are a bit of the tile peeking on each side. To get exact measurements, print 3.65 in. squares. Place them on top of the squares you made from Step 2. Cut out and round the edges with scissors. Press from the center going to the side of your map coaster to remove bubbles. STEP 4: Using the foam brush, apply a moderate amount of glossy Modge Podge on the tile. You want to brush enough Modge Podge that the map sticks to the tile, but not too much that it turns it to mush. Place the map squares at the center of the tile. Remove the bubbles by pressing from the center of the tile going out to the sides. Let it dry for about 30 minutes to one hour. STEP 5: Waterproof your DIY coaster by applying a layer of waterproof topcoat. For added waterproofing, apply 3-4 layers of Modge Podge over the map. Seal the paper by using a generous amount of Modge Podge around the edges of your map coasters. Allow each layer to fully dry before applying the next layer. STEP 6: Once dry, spray a layer of polyurethane for extra protection. 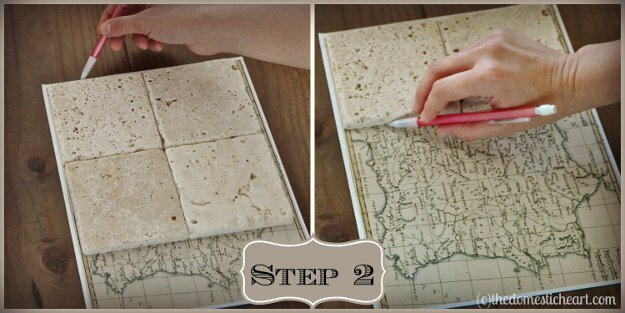 It also gives your DIY map coasters a great finish. Keep your furniture scratch-free by placing a piece of felt under your map coaster. STEP 7: Glue a piece of felt under your map coasters. This will prevent your personalized coasters from scratching your furniture. You can cut one large square or four smaller squares to put in each corner. See the world with these DIY map coasters. If you're going to give these map coasters as a gift, you can personalize them by changing the images. If you're going to give it to someone adventurous, keep the map design. If you're giving it to a book lover, pages from old books would be a great way to create personalized coasters. You can also use photos from old cookbooks if you're making them for a foodie. The possibilities are endless. 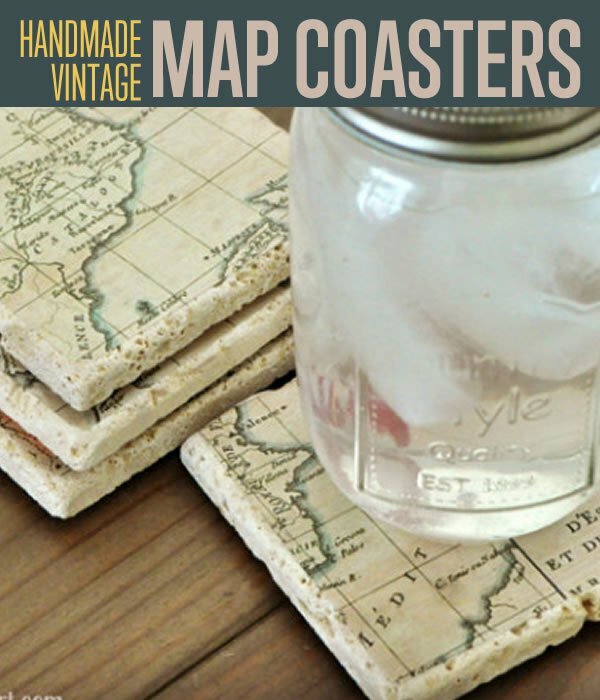 These map coasters are a great gift for travelers. These look great and I’m going to try this DIY out..these would make good Christmas gifts.. I have done this before using ceramic tiles and printed tissue paper. The finish with polyurethane spray is critical – otherwise, the items you put on the coasters will stick, I learned the hard way. Love your idea!